You can't live in fear. Since birth Johnny was raised around motorcycles and the excitement of cheering fans. For the most part he was happy being the son of Barton Blaze and Naomi Kale until his mother abandoned him. Keeping busy helping his father and becoming his understudy he repressed the memories of his mother. Johnny could not take part in the shows until he was eighteen. It was then he learned that his father was dying from lung cancer. Mephisto approaches getting him to sell his soul in exchange for Barton's healing. So Johnny made the deal and the next day to his surprise his father's cancer went into remission. Though he learnd it was but a trick when his father died in a crash during a show and that he would forever be cursed. Going on to fulfill his father's legacy, Johnny became a stunt rider that could perform incredible stunts and walk away unscathed from the most life-threatening crashes. 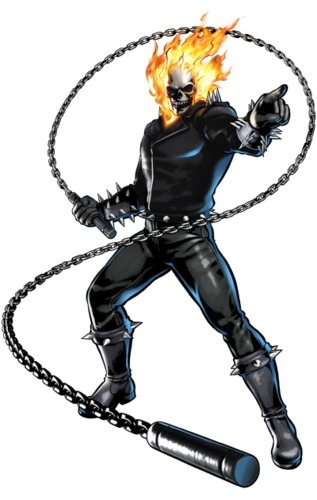 Mephisto appears around 2010 and gives Johnny his full powers of th Ghost Rider, a demon made to track down other demons and criminals. He was sent after Mephisto's son Blackheart whom was seeking a contract for a whole town of souls. On his first ride he hears a woman being mugged, he stops the mugger by using the Penance Stare, a power that allows a person to feel all the pain they ever caused others. Another rider going by Caretaker helps him along the way. Going after Blackheart he learns he is holding up in a place called San Venganza. Caretaker reveals himself to be Carter Slade another rider that kept himself alive. He shows Johnny the way and then gives him his shotgun (a sawn-off Winchester Model 1887/1901) and telling him to use the shadows before riding away. Johnny destroys Blackheart and shortly after Mephisto appears to give him his soul and take back the Ghost Rider curse. It is refused and vowed that he will use this power against him and all those that harm the innocent. Since this he has gone into hiding to come to a better understanding of his powers. Johnny since though has helped in situations in Gotham where Supergirl got rather upset with him and in Metropolis. His work at saving the innocent is never done. Friendly - He may not be the life of the party when not performing but he is friendly toward others and stays close to his friends. Its not unusual for him to share a beer with those that work for him after a show. If someone needs to vent or talk he is always willing to listen. Goals - With great power comes great obligation and he wants to learn control of it. In the greater scheme of things he does not want it to go back to Mephisto and will find a way to keep this from ever happening. This means taming the Rider inside to keep it close and doing as he wants without free reign. Loathing - Mephisto set him up and he regrets falling for it. He loathes the choice he made but for whatever time he has left will take it out on the guilty. One he expects there will be another meeting with Mephisto and he plans to be prepared for it. Motivation - Learning how to control the Ghost Rider within keeps him going. Using it to take out all who dares harm the innocent is his motivation. What could be used for evil he wants to be sure to use it for good. The Rider makes the guilty feel the pain of the innocent they have harmed and this can be horrifying. Showoff - Johnny loves showing off for the crowds with radical stunts. He wants to prove mostly to himself that he is doing them and not the Ghost Rider within. So he will always be looking for the next big thing to do to wow the crowds and gain even more publicity. Split Personality - On one side he is Johnny Blaze, a stunt rider that can do incredible things with a motorcycle to entertain the crowds. 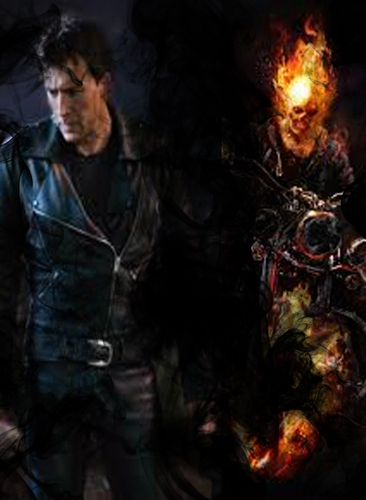 On the other he is the Ghost Rider, cursed demon that hunts other demons and all those out to harm innocent people. Most time the darker side comes out at night but on occasion he can put wrong in its place during the day as well. Darkness - Out of darkness springs only more darkness. He instills fear into the heart of the guilty and this fuels him. The Rider himself is not good and causes those found guilty to suffer their fates. The hero and the innocent do not feel his wrath, the righteous is safe from him. Goals and Motivation - Ghost Rider wants for nothing nor needs anything. His existence is to hunt down demons and avenge the blood of innocents. Blaze has pushed for him to protect those innocents and lay his wrath over the guilty. Merciless - The greater the evil the greater the vengeance. Blaze may show mercy but the Rider does not. Nothing can sway him from his path; money is useless, threats are meaningless, and begging for mercy goes unheard. Vengeance drives him and there is no turning back. Pyromancy - In his human form Johnny has limited use of the Rider's pyromancy. A little bit can be used through his shotgun in short bursts of fire. He can do this through his hand but prefers the shotgun which is better for his control. No where as powerful as when in Rider form. Transformation - When evil is sensed the Rider wants to come out and play. 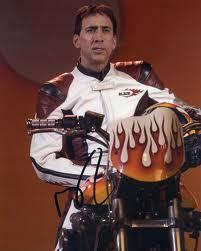 Johnny can transform into Ghost Rider in a manner of seconds or keep him held in until he is ready. Not only does he change but his motorcycle does as well. 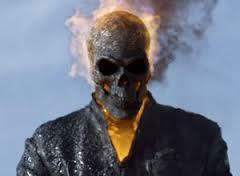 Daylight - Even in daytime he can transform into Ghost Rider. He might be a bit more noticeable or leave a bit more smoke in his wake but the wicked are never safe from his wrath. Invunerability - Ghost Rider does not feel pain and his skeleton lack anything to strike. He can be knocked back but absorbs blasts and blows that would harm most superhumans. Being knocked down, sent through the air, being tossed into objects nothing hinders him. He is immune to temperatures, extreme pressure, poisons, toxins, lack of air, and of course fire. The Rider is resident to some magical attacks though to a lesser degree than other attacks. If he does have damage he can heal quickly if not pursued. Though holy weapons can deal major damage to him explained in his flaws. 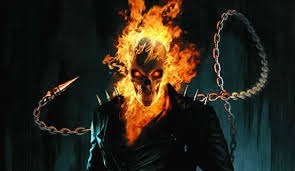 Penance Stare - Ghost Rider has the supernatural ability to cause any individual who stares into his eyes to see and feel every bit of pain they have ever inflicted on anyone in their entire lifetime. After exposure to the Penance State the individuals eyes are replaced with burn-out pupils. They must be within three feet of him where he can grab them or they can try to latch onto him. For it to work he has to be able to gain eye contact with his target. Those without a soul or the blind are immune to this stare. The target must be one that is unrepentant and wicked with the aim to harm innocents. Pyromancy - Large quantities of flame can be cast from the Rider and be controlled to an extent. Indeed he can torch buildings are other objects if he chooses but they can be put out with normal means. He can imbue objects to life with hellfire as he does his Hellcycle to warp the appearance into that of demonic means and powerful while in his hands. It wears off within an hour or two but his Hellcycle stays as is until he changes back to Johnny. Super Strength - Ghost Rider doesn't get tired or even weary. His strength is that above that of the average human, he can lift up to 25 tons and shove large heavy objects aside as he needs too. The Rider can lift a grown man with one hand and hurl him away. His strength is only matched by other demons. Detect Evil - Rider is drawn to evil people, those that prey on the innocent. These are rapists, murderers, those that dare to harm children are all on his radar. Closer he is to evil the greater the intensity he feels. Any criminal daring to get in Johnny's space will find the tides turned quickly on them. The range of sensing evil goes about thirty feet in all directions around him. 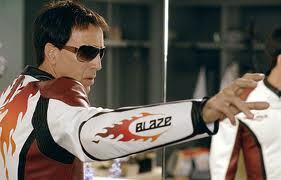 Blaze Motorsports - Quentin Carnival is where his father Barton did all his stunts and Johnny learned. 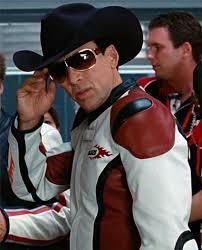 It is now Blaze Motorsports used for his stunt shows and selling of his merchandise. Johnny allows his crew to work on custom motorcycles. His home is wherever the show takes him next. 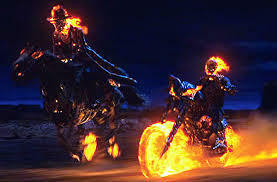 Hellcycle - When he transforms into Ghost Rider his motorcycle changes into his Hellcycle. Its capable of acting on its own and can be summoned from any distance. It can defy the laws of physics by going up buildings or over water. It can get up to speeds of 350mph. Hellfire Chain - When in Rider form he carries a mystic style chain that can change into multiple weapons. It obeys his commands mentally, it wraps around his torso waiting for when its needed. The chain can extend itself to various lengths and can grab onto targets like a lasso. The chain can handle up to fifty tons. Combat - He hasn't had any formal combat training but can hold his own as needed. Being part of the Quentin Carnival he did get into the usual scuffles and learned from the school of hard knocks. He can punch or use things around him as weapons. As the Rider the skill is much greater. No need to dodge he can pummel an opponent or use his chain as a weapon. Maintenance - Being raised around motorcycles he has a solid knowledge of how they work. Johnny can takes one apart and put it back together easily. He can customize bikes, rebuild engines which is rather also a hobby. Not only can he repair bikes but cars as well. Occult - Johnny has studied the occult to better learn about his powers and what he can possibly be put up against. This helps in being able to recognize and understand magical phenomena. Stunt Rider - Johnny studied since he was young to do stunts with a bike. As he grew older he only got better and went forward to fulfill the legacy of his father after his death. He can judge any situation to know if he can make the stunt or if he should abort it. No stunt is too big that he won't at last study over before deciding to give it a shot. When he is the Rider his abilities become much greater with being able to defy the laws of physics. Like riding up the side of a tall building or riding across water or take incredible leaps. Hell - He is on the bad side of Mephisto a devil of hell. Death won't bring an end to pain since his soul belongs to this devil. Johnny knows he will sooner or later come to collect from him. He has fended off demons before and its hard for him to keep friends. He has a demonic bounty on his head so any friends may also have to pay the price. Holy Ground - Johnny can enter consecrated areas but he can not transform into the Ghost Rider in these areas. The Ghost Rider being a demon can not enter these areas for any reason. Though if there is wickedness nearby the Rider will compel him to leave and gain vengeance. Human - Like any other human Johnny can get hurt, bleed, become ill. Other than the minor pyromancy he is only human. Though if someone does choose to scuffle with him it could get bad if the Rider comes out to play. Public Figure - Johnny is a minor celebrity known for his stunts. He is rather reclusive but some may recognize him when he does get out and about. 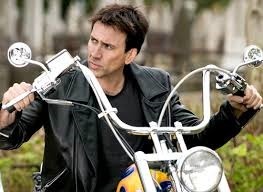 He does work hard to keep Ghost Rider a secret but indeed with the world as it is this gets tougher and tougher. Sanctified Weapons - Holy weapons can cause harm and cause the Rider pain. Just etching crosses on things does not work. The weapon must be consecrated and sanctified to use against him. A holy man with a cross may ward him back, holy water may burn him. Single Minded - Johnny has to use great effort to control the Rider. He can delay it long enough to get an innocent to safety but then the Rider will unleash to chase down its target until justice is served no matter where it has to go on the planet to do it. Wards - Wards that work on demons will work on the Rider. For a short amount of time it will effect him but wards he can wear down and break through it. The blood of the innocent calls out to him from the hands of the wicked which helps make the ward fall. Johnny Blaze is probably the preeminent living stuntrider and daredevil in present day. His reputation, overall, is comparable to that of Evel Knievel, though Blaze invariably insists that Knievel was better than him (certainly tougher; Blaze hasn't suffered near the injuries that Knievel did). When Knievel died in 2007, Blaze was one of the pallbearers, and would later write a letter that praised 'The Last Gladiator' for his skill and tenacity. Shows of respect like this have not only kept Blaze's fanbase solid, but have also gained him fans who venerated Knievel. More recently, Blaze's general manager died under what was considered unusual circumstances, and Blaze was briefly suspected, but no charges were ever filed. As a result of his good friend's demise, Blaze has taken a sabbatical from stuntjumping, though he still keeps in touch with his fans and friends (he writes a short column every week or so that is transcribed onto the Blaze Motorsports website, called the 'Weekly Burn', in which he answers questions, comments on the world, or generally complains about his inability to make a cup of coffee). Blaze is well known for moving around a little incognito, but he's happy to sign autographs and chat with fans if they're polite and don't cause a hassle. He has no objection to lending his name to worthy causes, particularly charities specializing in trauma care and children's care. A picture from a 2009 event still makes the rounds on the internet; a shot of a young cancer patient on Blaze's cycle, with Johnny right behind him and supporting him on the cycle.